Well the fat man is never going to get back in time, and with him gone that makes you the man of the house. 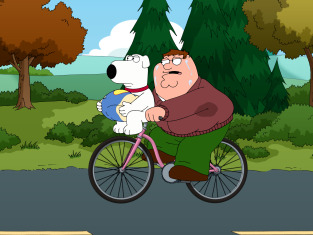 Family Guy Season 13 Episode 5: "Turkey Guys"
No, but why are you saying the dogs name before dads. Permalink: No, but why are you saying the dogs name before dads. Well last night me and Brian got drunk and ate the turkey, but before you get mad we also ate the salad. Family Guy Season 13 Episode 5: Full Episode Live!